A new update for The Football App was just submitted to the Nokia Store. This update adds the “Favorite Team” section for the Euro 2012 competition, allowing to have the full match schedule for any of the available national teams. The update should be available in the very next days for MeeGo, Symbian will follow in a few days. I was wondering if you could add the Turkish Süper Lig and the Dutch Eredivisie to your awesome app. I’m pretty sure I’m not the only one that asks for other leagues. I still hope this one will be accepted! 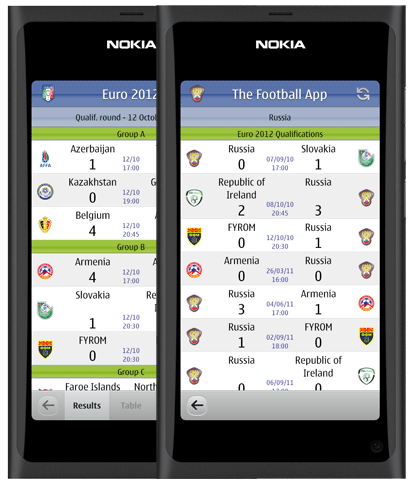 ← The Football App updated: now includes Euro 2012!